Just take a look at the pictures of these beasts on the left? Are these shots from National Geographic of some wild African predators? 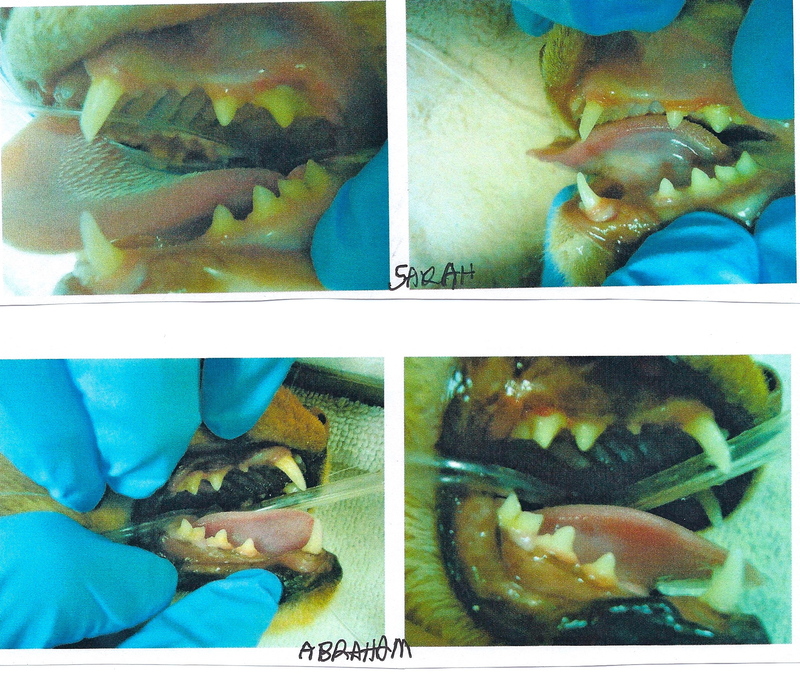 No, these are the before and after shots of our two Abyssinian’s – Abraham and Sarah – from today’s annual very high stress visit to our Vet – where they had their teeth cleaned. Our personal, human Dentist Dr. Mark Kuhl charges us $95 for a teeth cleaning. What do you think our Vet charges to clean Abraham and Sarah’s teeth? The answer is D – $425 and that’s not for two cats – that’s for one or $850 for the pair. If you have kids steer them towards some high-powered MBA Program where they can get a job on Wall Street as an Investment Banker making millions annually leveraging almost nothing into something worth at least 300 times its base value. If you can’t afford one of those programs send your kids to Veterinary School where they can charge $850 to have their Technical Assistant clean two cats teeth. OK – so you’re new to my blog – nowhere in the “About Me” section does it say I’m terribly bright! As Bon Jovi sang – “Have a Nice Day” and be happy you have a dog that will let you brush their teeth or better yet no pets at all – or is that why you found a husband? since I had a similar vet experience with our White cat. Has your vet recommended brushing their teeth at home? That was our vets recommendation. And brushing a cats teeth is not an easy task. It goes like this, I get one swipe in the mouth with a mini tooth brush, half of the cat flavor paste is on his face not teeth and the rest on me. It costs me $350.00 to have Tigger’s teeth done. I have tried brushing his, what a joke. There’s a lot to be said by having mutts. It’s amazing what a Vet charges nowadays. I feel your pain. I used to have to do the same with my diabetic cat. The pictures are awesome. Cat’s teeth accumulate a ton of plaque, don’t they? Larry at least you don’t have to have the cats groomed each month. We have a Maltese that has a higher monthly personal care expense than my wife and I put together. What we do for our fury friends! They are soooo cute!